Shortly after this fragrance came out around a year ago, I bought myself a 30ml bottle to see what I thought of it, having liked it on first impressions in the shop. When I ran out, I had to ask for some more for Christmas, and this time I was lucky enough to get 100ml! 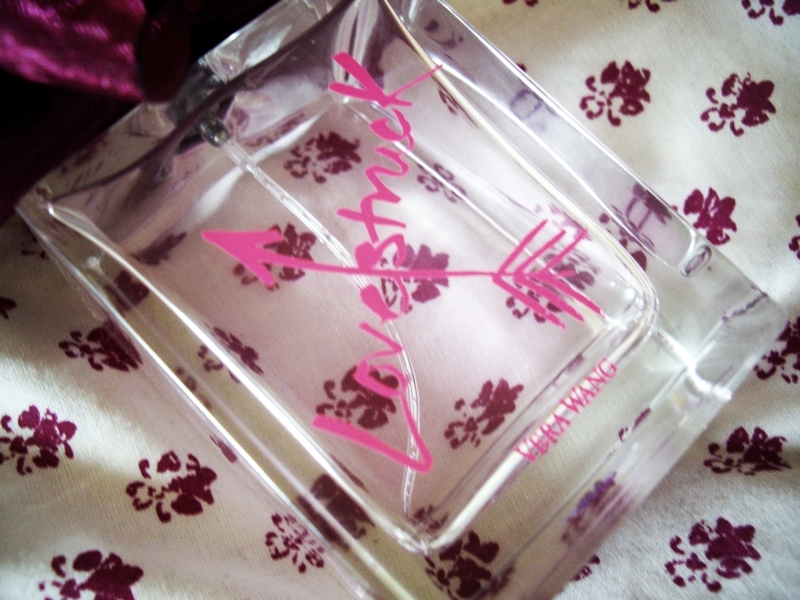 Why do I love this perfume so much? The bottle is beautiful. Its gothic, aubergine oversized flowers wrapped with chiffon & netting just on the lid gives an edgy addition to Vera Wang’s collection. It therefore looks amazing on my shelf. Pink guava and mandarin cover the top notes; I usually find these are the first to fade. A floral mix of tuberose and lotus blossom are in the middle notes, which I find lasts a couple of hours. At the base there are precious woods and a sheer musk; this is the scent that will last all night on your skin. The sweetness of the fruit can be overpowering at first, but giving it a few minutes or so to settle on your skin helps you smell how lovely this perfume is. The fact that it’s Eau de Parfum really helps it last at least 3-4 hours before needing to spray it again. The campaign topped this fragrance off for me – a modern twist on Romeo & Juliet, and beautiful Leighton Meester who I love! I’ve always liked Vera Wang’s fragrances; the ‘Princesses’ are young, sweet and girly, which is what I look for in a perfume. The only downside; I wish they were more long-lasting. It’s really off-putting having to re apply all of the time, as you don’t feel like you’re getting your money’s worth. Sort it out Vera! I have not smelt this yet but I love the packaging!